For my Final Trailer Tuesday of 2014 I want to take a look back at the past year and share my favorite Book Trailers released this year. As many of you know I love Book trailers and when done right they can create that much more anticipation and excitement for me in conjunction with the normal promotional stuff. I want to say a big Thank you to all the people who continue putting out High Quality Book trailers. I really appreciate the time, thought and creativity put into them and look forward to each new one I find. So let's get started, shall we! Whether your a fan of the Classics or slapstick Holiday fare, Christmas Movies are an integral part of the Holiday season for many of us. We all have our favorites and this year I figured I'd share some of mine with all of you. So in no particular order (Save my #1 pick), Here are my Top Ten Favorite Christmas Movies! "Don't expose him to bright light. Don't ever get him wet. And don't ever, ever feed him after midnight." "Come on now, Daddy's not angry! No, Daddy's very angry!" "Forgive me, Mr. Claus. I'm afraid I've made a terrible mess of your holiday." This week I have some awesome and best of all Free Zombie E-books to share with you all! All books listed are Kindle Editions unless noted differently. All titles are linked to Goodreads for your convenience. In August 2016, the President of the United States announced to the nation that he was signing into law Executive Order 14245, The Zombie Assimilation Act. The following day, millions of zombies who were being imprisoned in camps around the country were released into the general population. 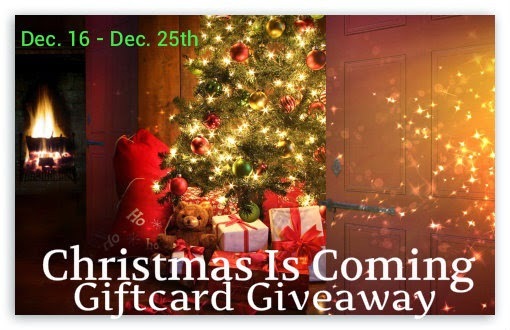 Christmas Is Coming Giftcard Giveaway!!! Since Christmas is Coming up in less than 10 days, I thought it would be the perfect time to throw a Giveaway!! As if you can't tell already, I love books. In fact, I'm very rarely seen without a book in my hand (as those who know me can attest to). Books bring comfort, they make us laugh or cry with a turn of the page, they transport the reader through time and space and even have been known to save the world (true story). Needless to say I'm a huge advocate of the written word. Is genetically modified food an end to world hunger - or a first class ticket to the apocalypse? Dan Miller is a plant biologist working with a small team perfecting an accelerated plant growth process. When things go wrong, Los Angeles pays the price in a disaster story unlike any before! ReviewWildfire was a graphic novel I stumbled across as a recommendation in my email. As soon as I read the premise I knew this was one I'd have to read. While the story of Wildfire might be fictionalized, The battle over GMO's and the corporations who push them on the public is something very real. Even though Wildfire is meant to be read as Science Fiction I couldn't help but think how something like this could happen as more and more Genetically Modified seeds make there way into the general population. The Memory Key by Liana Liu. With time running out, Grace must unmask the Reaper before he destroys everything she cares about for ever.. When Cora Mason wakes in a desert, she doesn't know where she is or who put her there. As she explores, she finds an impossible mix of environments--tundra next to desert, farm next to jungle--and a strangely empty town cobbled together from different cultures and time periods, all watched over by eerie black windows. And she isn't alone. Book Trailer Tuesday is a Weekly Blog Post hosted by me at Blood Sweat and Books. Each week I choose two Book Trailers to showcase. One Trailer will be for an upcoming book and the other will be one that has already been released. This week I focus my spotlight on Stray by Elissa Sussman & Now That You're Here by Amy K. Nichols. Stray by Elissa Sussman I am grateful for my father, who keeps me good and sweet. I am grateful for my mother, who keeps her own heart guarded and safe. I am grateful for my adviser, who keeps me protected. I am grateful for the Path, which keeps me pure. Ever after.